Build your own tactile controller for editing Photos & Videos! 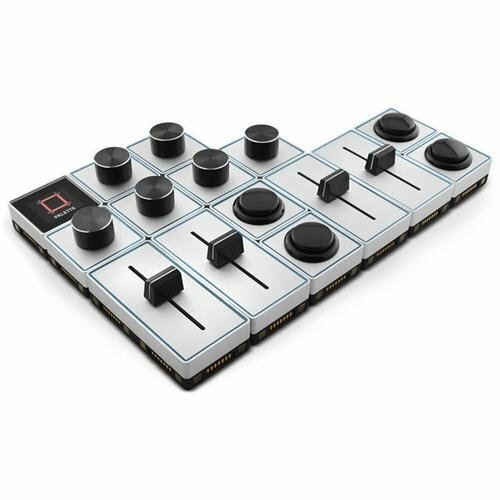 Snap together sliders, dials, and buttons to create a controller made to fit you and your unique editing style. Get up and running with the Palette Pro Kit and add modules as you need them. If the Pro Kit is a little big for your needs, be sure to check our Palette Starter Kit or our Palette Expert Kit! Build your own tactile controller - snap together sliders, dials and buttons to create a controller made to fit you. Create multiple profiles to reflect your workflow. The colour OLED screen and system notifications show which profile you're currently on. Palette's Community page allows you to share your profiles or download others. Simply connect Palette via USB to a MAC or PC and use the desktop PaletteApp to assign the dials, sliders and buttons to your most used adjustments, keyboard shortcuts, MIDI commands or media controls. No programming required. If you have any questions about this product by Palette Gear, contact us by completing and submitting the form below. If you are looking for a specif part number, please include it with your message.